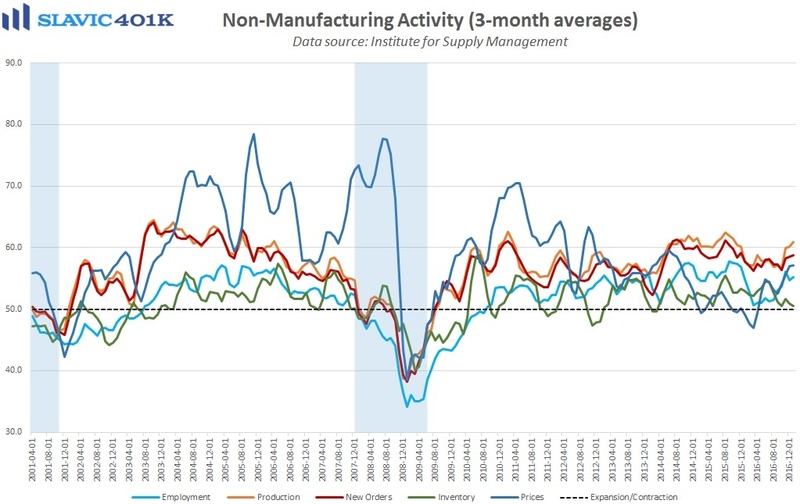 The purchasing managers' index (PMI) from IHS Markit for the U.S. services sector, which accounts for a much larger share of the overall economy than manufacturing, ended January at 55.6, a nearly 2-year high. That was a better rebound than expected and surveyed business managers attributed the higher level of activity to “improved sales growth and a more supportive economic backdrop.” Volumes of new work expanded at the fastest pace since July 2015, which put additional pressure on operating capacity. Order backlogs also continued higher in January and many service providers responded by bringing on additional staff. However, some surveyed managers said that “squeezed margins had acted as a brake on employment growth at their business,” not surprising with input prices attributed to “higher fuel costs and greater salary payments” reportedly rising faster than prices charged. Looking ahead, services sector firms signaled another rise in business optimism regarding the 12-month growth outlook, and Chris Williamson, chief business economist at IHS Markit, added that “The January surveys signal annualized GDP growth of approximately 2.5%, setting the scene for a solid first quarter. 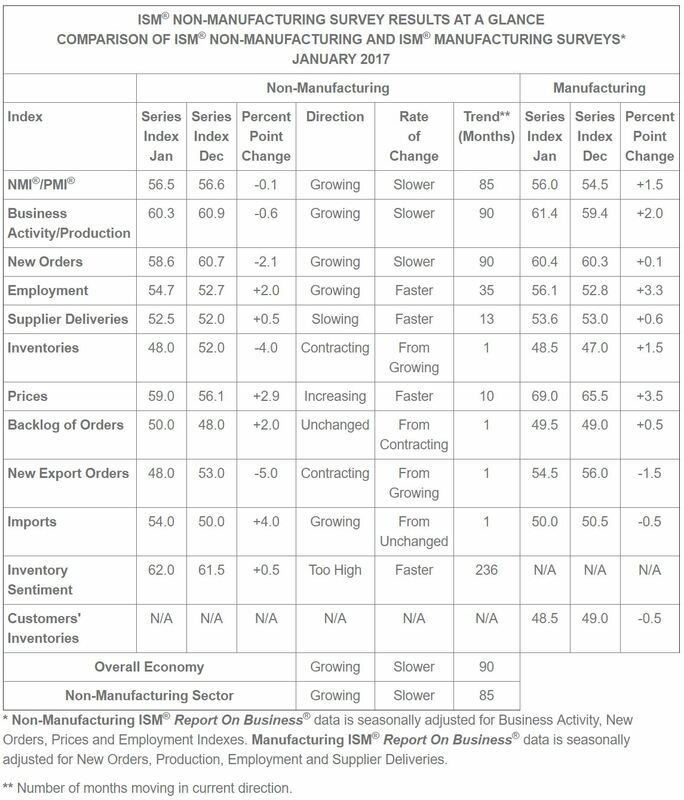 With January seeing the largest inflow of new business for 18 months, there’s good reason to believe that firms will be even busier in coming months.” Slightly less encouraging was the Institute for Supply Management’s (ISM’s) non-manufacturing index, which ended January at 56.5, down fractionally from December and worse than anticipated. Measures of new orders, production, and exports deteriorated last month but employment improved. 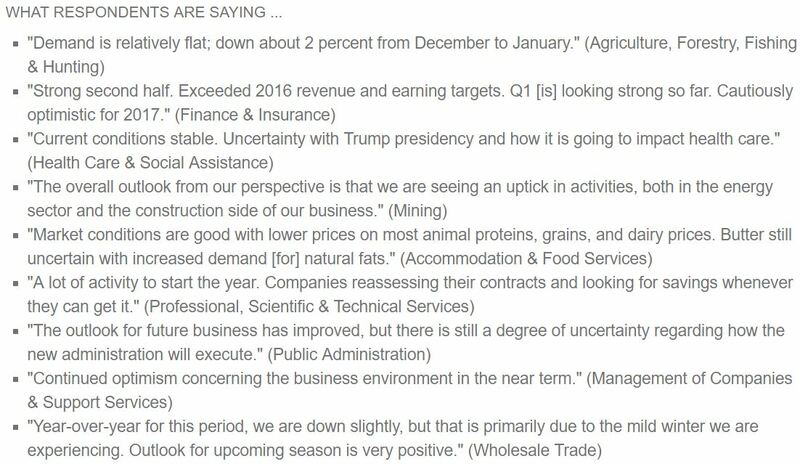 Comments from surveyed managers in January were somewhat mixed.